UC Berkeley scientists have developed a new 3D printer that transforms liquid polymers into complex solid objects using only light. Called the ‘Replicator,’ the Berkeley invention is capable of creating objects that are smoother, more flexible and more complex than what is possible with traditional 3D printers. According to the researchers, it can also encase an already existing object with new materials – like adding a handle to a metal screwdriver shaft – which current printers struggle to do. “I think this is a route to being able to mass-customize objects even more, whether they are prosthetics or running shoes,” said senior author of the paper and assistant professor Hayden Taylor. “The fact that you could take a metallic component or something from another manufacturing process and add on customizable geometry, I think that may change the way products are designed,” he intones. 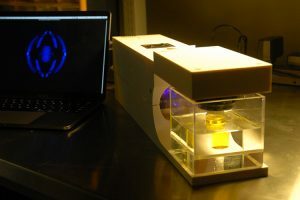 The new printer draws its inspiration from computed tomography (CT) scans that help doctors locate tumors and fractures within the body. According to the researchers, light activates the photosensitive compound which depletes the oxygen. Only in those 3D regions where all the oxygen has been used up do the polymers form the ‘cross-links’ that transform the resin from a liquid to a solid. The unused resin can then be recycled by heating it up in an oxygen atmosphere, asserts Taylor.